KUMANTONG FOR YOU: WHAT IS RUK YOM ( LUP YONG) ? WHAT IS RUK YOM ( LUP YONG) ? The story about Ruk-Yom (รัก-ยม) or "Lup Yong" can be first found in Tum Rub Pook Hoon Pra Lob. The story told about a model of a boy created to be a playmate of Pra Lob, the son of Nang Sida (Sita) in Ramayana ( The Ramakien, Thai:รามเกียรติ์ ). This story became an influential example for the followers who wanted to create Ruk-Yom. "the hermit Watchamareuk builds her ( Nang Sita) a cottage and she later gives birth to Phra Ram’s son, naming him Phra Mongkut. Another boy, Phra Lop is magically created by the hermit to be Phra Mongkut’s playmate and adopted brother"
Some people worship both Kuman Tong and Ruk-Yom because they believe the power of them could compliment each other and that would bring them prosperity. Take note that the legend of Ruk-Yom is different from Kuman Tong but both appear similarly such that the statues come in the shaped of young boy. To differentiate between Kumantong and Ruk Yom, all you have to do is to know Kumantong is a single statue of a Young Boy and Ruk-Yom always come in a pair of statues or mini wooden figurines with the shape of Young Boy. The Spiritual Master has the Joss sticks lighted and begins to recite incantation and then he will begin to craft the small figure of young boys from the wood of Ruk Son and Star Gooseberry Trees. Before doing this, he has to recite an incantation over a dagger which will be used in crafting the statues or figurines. Spells are then written on the figures' forehead, both hands, chest, and both legs. Then he will bath his talismans in scented oil which he has already recited an incantation over. 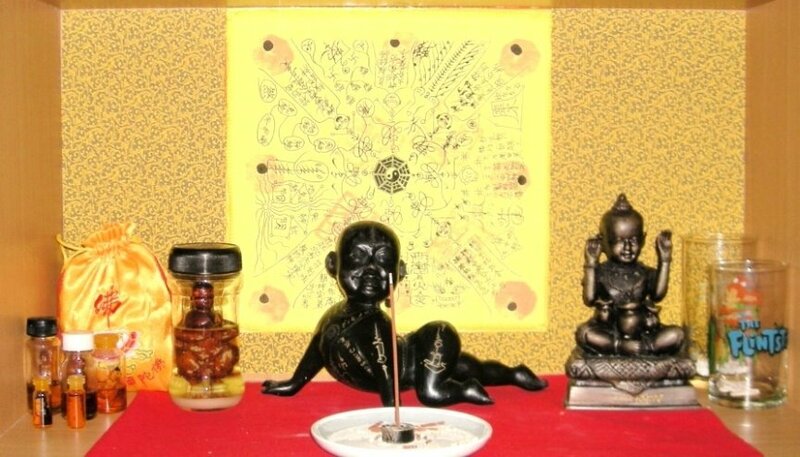 The Spiritual Master has to recite sacred spell until a pair of talismans float on the surface of the scented oil and that can be called "Ruk-Yom". 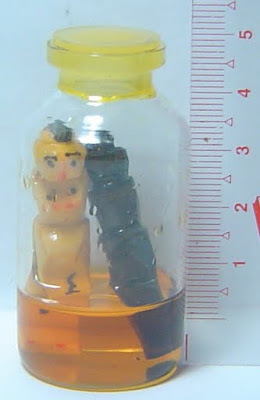 Some masters will put the small figure of young boys in tiny bottles and recite their incantation over them until they turn facing each other. 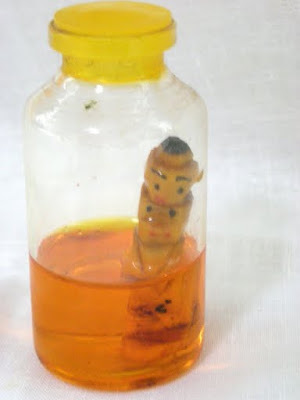 Usually Ruk Yom ( Lup Yong) come in Mini Oil Bottle Version.